Dyson is well known for being the market leader when it comes to vacuums thanks to their well-designed and powerful machines. I’ve gone through several vacuums in the last few years and they always seem to give out within 12 months. I’ve had a few that didn’t last past a month of normal use. It’s a game that can get expensive pretty quickly and make you wonder how it is your mother made that old vacuum of hers last 30 years but you can’t seem to get past 30 days. That all changed when I started to use the Dyson Cinetic DC77. It’s a low maintenance rock-star of a vacuum. Here we are months into use now and it still performs like day 1. I actually have hope that I might just hit that 30 year mark with it. The thing about the Dyson Cinetic DC77 though is that it is at a price point that many Canadians just are not comfortable with. Well some good news for those of you who are craving a Dyson in your life but just can’t swallow the cost! 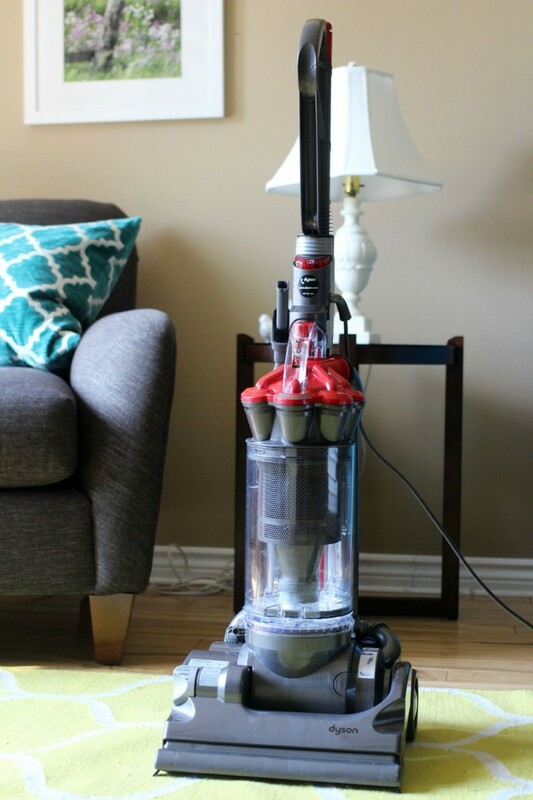 Introducing the Dyson DC33 Multi Floor Upright Vacuum, newly exclusive to Canadian Tire! This is a great machine for you if you’ve always wanted a Dyson but have found the cost prohibitive as it is priced at only $399.88. It features the same great technology that Dyson is famous for including Root Cyclone ™ technology that capture more microscopic dust than any other cyclone and a HEPA filter that traps microscopic pollen and allergens, which makes it ideal for allergy sufferers. I was interested to see how the Dyson DC33 Multi Floor Upright Vacuum stacked up and put it to work right away. I tested it out on my wool area rug first. I hadn’t vacuumed for a few days while I was waiting for it to arrive so there were visible bits on the carpet. I found that the Dyson DC33 Multi Floor handled the mess pretty effortlessly, the pick-up power is great! I feel like there is a definite power difference between it and my Dyson Cinetic DC77, which isn’t much of a surprise at such different price points. The end result is still pretty comparable with just a little bit more effort on the part of the Dyson DC33 Multi Floor. Going from my area rug to my hardwood floor is a simple adjustment and I have to say that I love how this machine handles hard floor vacuuming. It also handles my rec room carpet well which has a higher pile than the area rug in my sitting room. This is thanks to the self-adjusting cleaner head which maintains contact with your floor to seal in the suction. I’ve had vacuums where you have to make the adjustment and I always found that it was really inefficient so I appreciate how well this action works. The one issue I have with this vacuum is the size of the cleaner head. It does manoeuvre nicely enough around my furniture but I find it difficult to vacuum under my coffee table in a way that is not an issue with the DC77. That said, the DC33 does come with three added tools to help you get the most out of the machine including a combo accessory tool which features a nozzle for large debris that converts to a brush tool for dusting, a stair tool that attaches to the removable wand or hose, and a flexi crevice tool which helps you get in between your furniture for a more thorough clean. When it comes time to emptying the bin it doesn’t get any easier or cleaner – simply hold the bin over a garbage bag and press the button to release the dirt. The bin then easily pops back into the vacuum. I also really appreciate that the Dyson DC33 Multi Floor features two washable filters. Since there are also no bags to replace there really are no extra costs with this machine. The Dyson DC33 Multi Floor also features a five year parts and labour warranty redeemable at Canadian Tire. I always feel better knowing there is a long warranty period, don’t you? Overall I am quite happy with the performance of the Dyson DC33 Multi Floor and would definitely recommend it to those who are hesitant to invest in one of the other models. 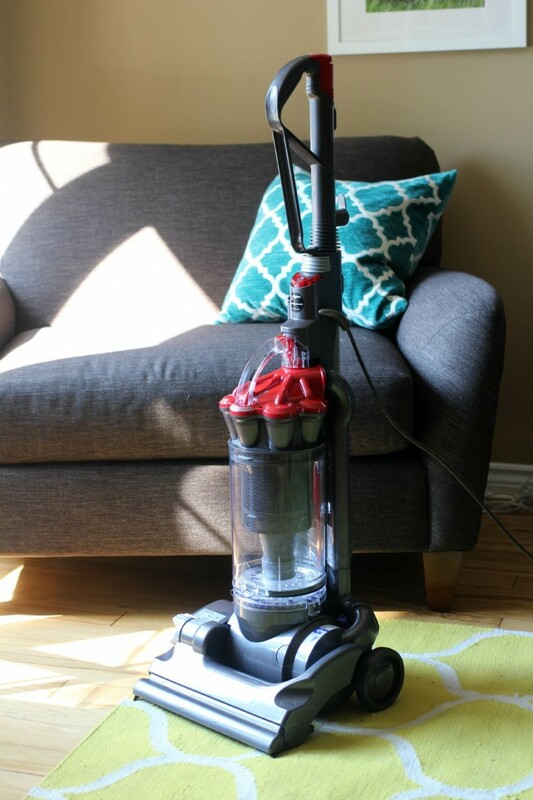 One Canadian Frugal Mom Eh reader will win their own Dyson DC33 Multi Floor Upright Vacuum! Giveaway ends on September 13th at 11:59 pm EST. See Giveaway Tools for entry and t&c. I like that you can go from rug to hardwood. I appreciate that feature as my house has both. my fav?-the 5 year parts and labour warranty. the cord length makes it easy to manoeuver around my home! My fave feature is that it goes from various floor surfaces easily. I love love love the “self-adjusting cleaner head which maintains contact with your floor to seal in the suction” Since my floors are mainly laminate with a couple of small rugs it would be nice to just vacumn it all without making a changes to the vacumn. With now four dogs living with us I vacumn every two days so I appreciate the ease to just pull out the vacumn and get it done. I just love what Dyson offers in vacumns. I love that there are no bags and that the filters are washable. Also nice that it is a simple adjustment to go from carpet to hard surface. We have wood, carpet and ceramic tile so to be able to use it on all of them is the best feature for us. Love the fact that it’s bagless *no dust!!! * and that the filters are washable. I like that it is bagless and can navigate multi surfaces smoothly, looks like it can really inhale the dirt and dust! I have to say my favourite part is the self-adjusting cleaner head which maintains contact with your floor to seal in the suction, that’s the best!! I like that this vacuum doesn’t use any bags. I love that the Dyson DC33 is bagless. My favourite feature is that this vacuum is bagless. love that it has two washable filters. My favourite reature on the Dyson is it’s great suction power! Thank you! My favorite feature is the permanent HEPA filter traps pollen and allergens. I love the Root Cyclone technology. I have cats and need all the suction power I n get! I love that they Dyson DC33 is bagless and has great suction. I like that the self-adjusting cleaner head maintains contact with the floor to seal in the suction. I like that it is bag-less! I love that this is bagless and that the filters are washable. I like that it handles hard floors well because that is actually the majority of my apartment! The HEPA filter is a huge bonus for me since I suffer from indoor allergies! I love the versatile option to use on various floor surfaces because we have hardwood, ceramic and carpet in our home. I love that there are no bags and the filter is washable!! I love Dyson! Love that it’s bagless and picks up lots of dirt. I love the different attachments that come with the DC33 – it’s perfect for our couches and stairs since our little kitty sheds like mad! 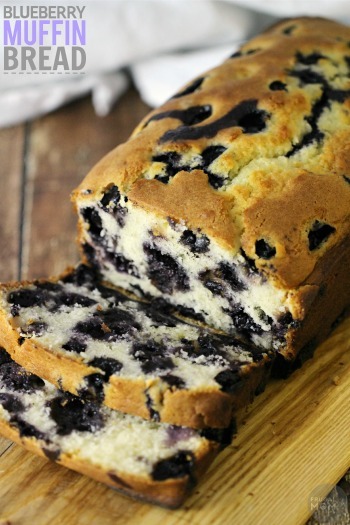 The bagless feature is the cake, and the HEPA filter’s the icing, for sure. …I LOVE DYSON…The Best Part is NO BAGS to Empty !!!! My favourite feature about the Dyson is that it is bagless and super powerful! I LOVE that you can go from carpet to hardwood!! I like that I can vacuum my hardwoods with it. like that it is bagless. And its easy to empty the bin. I like that I can use it on all my floors and goes from one to the other easily. Although there is much I do love about the Dyson DC33, I think the best part is how easy it is to empty! Holding the canister over the bin and pressing a button can’t get any better. I like the bagless feature – makes for easy maintenance. I love that it has a washable HEPA filter to help trap allergens and other itty bitty particles. Love the extra cleanliness it provides. 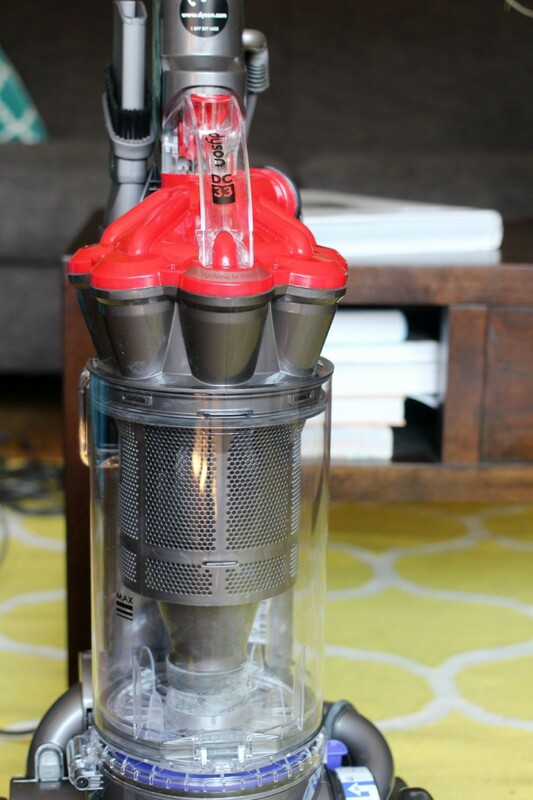 My fav feature is that the Dyson DC33 Multi Floor features two washable filters. I think the warranty is unbelievable! I love the fact that it’s easy to empty! There’s nothing worse than getting dirt Ll over the floor when you’ve just vaccuumed! No bags mean no mess! I don’t want to clean the floor twice! There are so many awee features it’s hard to pick just one!! Hmmm..if I had to though I think I’d say the self adjusting cleaner head! So awesome! My favourite feature of the Dyson DC33 Multi Floor Upright Vacuum is that it is bag-less, not only is more cost effective to save on buying or running out of bags, but if you ever by accident vacuum up something such as jewelry or an item by accident, it is easier to see and retrieve from the see through container. The multi floor ability! My current vacuum just spits dirt everywhere if you go off the carpet! Wow – So many features I love! The most I love is the easy remove and empty to dust canister. No more touching or replacing the dust bags! I like that it is bagless! the 5 year parts and labour warranty. The long warranty. I have gone through so many vacuums its actually disgusting. I should have bought a dyson all along, but alas I had my central vac fixed but it’s just so heavy and I have to change the ends all the time. It does not go from hardward to wood floors without having to power off and change the tools around. For someone like me who is on a fixed income any Dyson vacuum is just a luxury I could never afford. It would be a dream come true to own one. 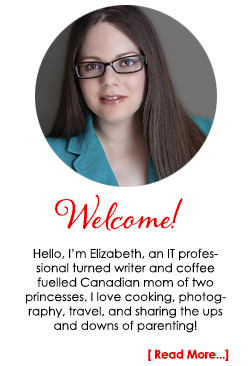 For now, I will content myself in reading your blog and hope to be lucky enough to win one. I would have to say that what I like most about this Dyson is its versatility and I like that there are no bags to empty like the old vacuums. I love that it is bagless and has a five year warranty! I like that it is easy to empty and has a washable filter. I love that it’s multi-floor. Our bedrooms are carpeted, but the rest of our house is hardwood. Perfect for us. My favourite feature is Root Cyclone! We have seasonal allergies in my household. 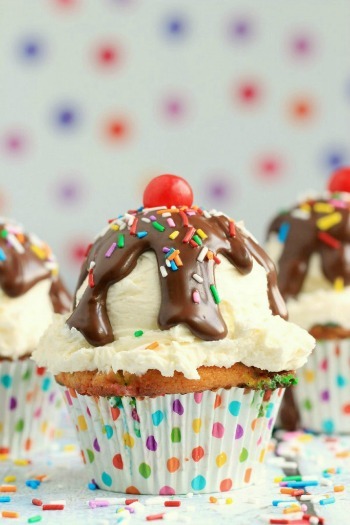 There is absolutely nothing to NOT enjoy or like about this unit! The fact that it’s a Dyson….I’m dying to try one!!! I hear only amazing things about these. I have hard wood and carpet so to be able to use it on both is the best feature for me. Bagless is my favourite feature. I’d love to win this Dyson DC33 Multi Floor Vacuum, it has all the features that I need! My fave feature is that its bagless and I can get in there and clean. I also Dyson’s has he most powerful suction of any line out there! No bags and no suction loss! I love that it is bagless and the 5 year warranty thru CT- Wonderful!!! My favourite feature of the Dyson DC33 Multi Floor Upright Vacuum is the Root Cyclone ™ technology – we have allergies in our family and it will make a world of difference to our health! I would love a new vacuum!!!!! I really like the 5 year parts and labour warranty which is redeemable at Canadian Tire. I like there are no bags to change! No more bags, and it goes from carpet to hardwood. Would love a Dyson! so many great feature, one I love is no bags and that the filters are washable. I love the smooth transition from tile hardwood and carpet. And the suction power! Love that the filters are washable. Thanks! I like that I don’t have to worry about changing the vacuum bag! I love that it goes from floor to carpet automatically and that it has washable filters. And no bags. And great for those of us with allergies. I love it, period. I like that it works on all types of flooring and carpeting. 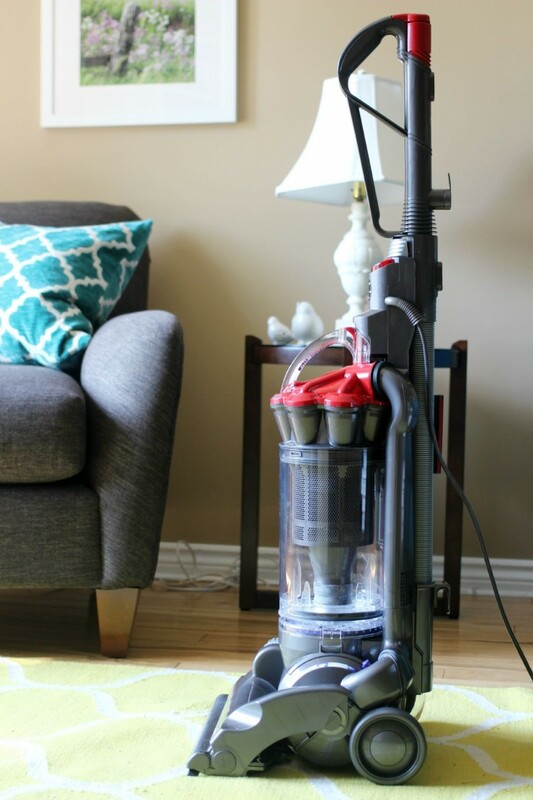 My favourite feature of this vacuum is that is has a HEPA filter that traps microscopic pollen and allergens! I love that it has no bags which means I am not having to replace and spend more money. The five year parts and labour warranty is an added bonus. The fact that it doesn’t lose suction is the best feature. Our last two vacuums have suffered from that issue! I like that you can go from floor to different floor with no problems! I like the stair tool, and the great warranty! I’ve heard fabulous things about Dyson. I love that is bagless and never loses suction! You can use it on any type of flooring! Awesome! No bag – even better! My favorite feature of this vacuum is the self-adjusting cleaner head which maintains contact with your floor to seal in the suction. Thanks for sponsoring this awesome giveaway and for the opportunity to participate. Favorite feature is that it is bagless. But that it goes seamlessly across all flooring types is extremely handy too. Love that it is bagless hate. PLaying with bags! self-adjusting cleaner head which maintains contact with your floor to seal in the suction, I have carpet and hardwood floors. I love how it works on different flooring! I love the stair tool! I Love the HEPA filter to help with my allergies! I love that the filters are washable! The washable filter and ability to go from carpet to laminate are both great features. I love that it can easily move from carpet to hard floor! Great feature!! I love how it transitions so easily from hardwood to carpet. I hate having to change the attachment. My favorite feature is it is bagless! My favourite feature is that the Dyson can even do hard floor vacuuming!! I love the self-adjusting cleaner head which maintains contact with your floor to seal in the suction!! The patented Root Cyclone technology. This vacuum has a lot of features that I like but my favourite is the self-adjusting cleaner head that maintains contact with your floor to seal in the suction. I like that this Dyson vacuum has washable filters. LOVE that there are no bags to replace! My favourite feature is how it can adapt to different surfaces! Thanks so much! I like that there is no bags and the filters are washable. My favourite feature is it’s bagless. My favourite feature of the DC33 is the easy,no mess way of emptying it! The power and suction aren’t far behind! My favourite feature is that there are no bags to replace. No bags! I love ‘no bags’! I love that it does lots of different types f flooring. From Floor to Rug without losing suction – and no bags! I like the fact that it has a 5 year warranty. The HEPA filter is great. I like that it’s bagless. As a sufferer of allergies and Asthma I love the fact that the HEPA filter removes microscopic pollens and allergens. It would be great with cat and dog hair, so much of it around, hard to keep up with with just a broom. i love the 5 year parts & labour warranty! I love the awesome 5 year warranty. Sheesh, I have to pick my favourite? That’s tough…there are so many, but I would have to say the multi floor and bagels features…but really it’s the quality of the Dyson that’s my favourite. I’ve wanted one for years! Darn spell correct lol..bagless not bagels ? I love the fact that it is bagless! Wow great! I love the washable filters and that there is no bags. I like the 5-year warranty and the bagless feature. My favorite feature is the self-adjusting cleaner head. This would work much better than my current vacuum. I love that there are no bags to change!! My favourite feature is how easy it is to go from carpet to hardwood. I like the 5 year parts warranty, too often these days things die out after a year so this is fantastic. I like the adjusting head for different floors and the 5 year warranty!! I have killed a few vaccuums! The cyclone technology is my favourite feature. I really like the self-adjusting cleaner head……but the way this vacuum manoeuvres is quite impressive too! the incredible suction and no bags. I like that it comes with a 5 year warranty! Would love to own a dyson. No loss of suction is huge for me! My vacuum now is in dire need of help! 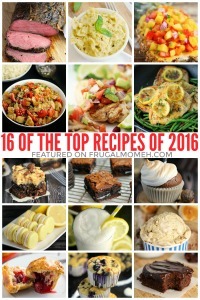 fave feature: lots! but easy transition from hardwood to carpet. My favourite feature is that is goes from carpet to hard floor, perfect for my house. I love that it even cleans hardwood floors. I have hard wood in my living room and this would be awesome. I like that it has a self adjusting cleaner head. No changing it for different floors. Love the dyson for it’s reputation of quality! I really like the self adjusting cleaner head. What a great feature! I like the flexi crevice tool attachment. It would be great for all the hard-to-reach corners of the house. My favourite feature is the washable filters. My old vacuum had really expensive filters I had to replace. I really love that its bagless and has two washable filters. My favorite feature is that it’s bagless. It’s a Dyson….what’s not to love !!! I like the 5 year warranty and the easy empty feature. My favourite feature is the Dyson DC33 is bagless. One of my fave features is that it has filters, no bags, and then I am not always having to buy bags. I love that one machine works on multiple floor types. I like that fact that it can easily go on different floor types. The added tools. Thanks liked and shared. I like that five year parts and labour warranty. I love that the filters are washable, and the warranty!! That is an awesome warranty! The washable filters is my favorite feature of the DC33, it makes life so much easier! And the flexi crevice tool would be so handy for getting into the smallest cracks of the furniture. I love that it does not lose suction. My favorite feature about the Dyson is the fact that it’s bag less and the filters can be washed. Love the warranty, it shows they believe in the quality of a Dyson. My favourite feature of the Dyson DC33 Multi Floor Upright Vacuum is that it is easy to maintain because it features 2 washable filters and is bag-less. With as many animals as we have – the suction! I like the HEPA filter – lots of allergies in this household. Love the two washable fitlers! The colour rocks too! I like the HEPA filter that works great for allergies. The fact that it is bagless makes it a winner for me! to be sneeze free,the dream of everyone with allergies! hepa filters rock! With all the animals in my house, I love the suction and the fact that it’s bagless (bags fill up with dog hair way too quickly!). I love that it can be used on different kinds of floors. That it is bagless and can be used on so much more than carpets!!! No bags and washable filters? Amazing! I love that it works well on various surfaces. Would love to try a Dyson. I have heard so many great comments about the products. My favourite feature is the washable filters. I love that it is bagless and has a washable filter and also the suction power. I have three large dogs plus a cat and owning a Dyson would make vacuuming a breeze because it would get the job done right! Love the suction power and the washable filter. The fact that it’s bagless is perfect. Like that Dyson does not net a bag. Also, their Permanent HEPA filter traps pollen and allergens. 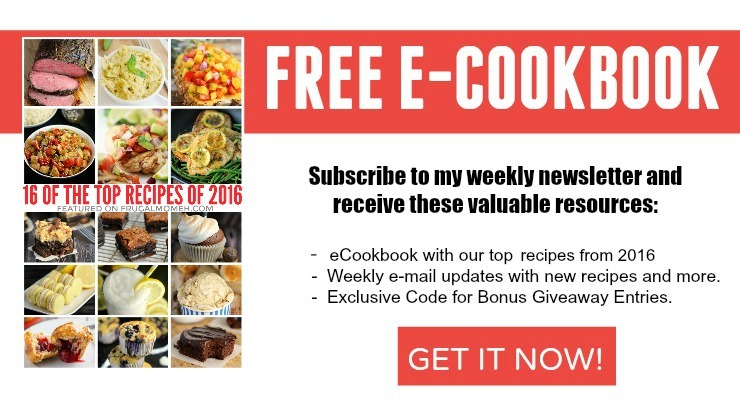 great feature and giveaway, too. I love that I can use it on different surfaces and how great the suction is! I love that it does many floor surfaces, and the cord is extra long. The cord length, constantly plugging and unplugging now. I love that it is bagless (and big bonus, that it has a HEPA filter). I need a new vacuum cleaner. Love to test this on dog hair!